Members of MGA's BOLD student organization. Cochran Campus-based members are in the top photo. The bottom photo shows Macon Campus-based members. As a freshman, Trevone Sullivan knew he needed to do more than attend classes and study if he wanted to make the most of his time at Middle Georgia State University. So he wandered over to the Cochran Campus club rush that fall hoping to find an organization or activity that felt right. One of the first students he met was Aaron Lewis, then president of an organization called Brothers of Leadership and Distinction, or BOLD. "Once I talked to Aaron, everything clicked," said Sullivan, now a junior and the current president of BOLD's Cochran Campus chapter. "Being part of BOLD has made a big difference in my life." With about 60 total members in chapters based on the Cochran and Macon campuses, BOLD is one of the most active student organizations at Middle Georgia State (MGA). Members attend leadership conferences featuring nationally known speakers, take part in service projects (everything from picking up campus litter on Sunday mornings to collecting winter coats for people in need to playing bingo with residents of a nursing home), host talent shows, and organize Cochran vs. Macon BOLD chapter basketball tournaments. BOLD members also participate in mandatory study sessions and, with help from other MGA offices such as Career Services, get advice on resume building, dressing professionally, and how to interact at meetings and other organized events. "At our first meeting every semester we have all the members stand up and tell something about themselves," said Jason Vadell, 22, a junior majoring in business administration and president of the Macon Campus BOLD chapter. "There's no better place to start practicing your public speaking skills than in front of your peers." 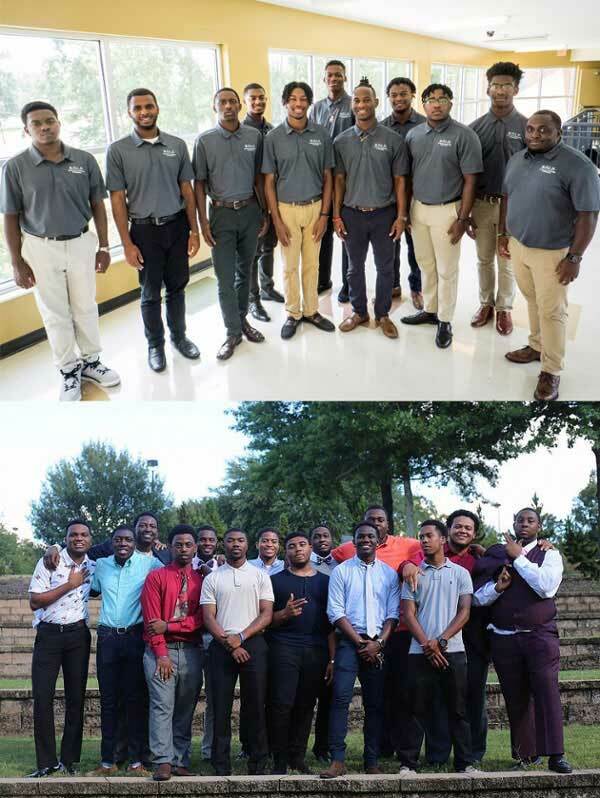 BOLD has been part of Middle Georgia State for several years, but the organization got a major funding boost in 2017 when the University System of Georgia’s African-American Male Initiative awarded MGA a $20,000 grant. The funds support initiatives designed to help African American male students stay in school, steadily progress toward earning degrees, and to graduate. "Statistically, African American males are the least likely to complete college degrees," said Dr. Corey Guyton, MGA's director of Student Engagement and advisor for the Macon Campus BOLD chapter. The reasons vary. Many, though certainly not all, young African American men did not grow up in environments where college was encouraged. And with African American male professors and professional staff underrepresented at many colleges and universities, "There is a lack of people who look like them to serve as mentors and role models," said Guyton, who is African American. "A lot of guys stop by my office to visit just because they are happy to see somebody who looks like them." That's one reason Guyton takes BOLD members to leadership conferences where the keynote speakers are professional, highly accomplished black men. Demetrius Smith, a Residence Life coordinator on the Cochran Campus who advises the BOLD chapter there, also accompanies the students to such conferences and to other events. Both Smith and Guyton can point to students who were pulled from the brink of failure by getting involved with BOLD. "I was dealing with one student who was down to his last chance," Smith said. "His GPA was low, he was skipping classes, and acting out in his dorm. I recruited him to join BOLD, and it proved to be a great demonstration of how the person you become is influenced by the people you hang around. He turned things around and eventually became a leader in BOLD." Vadell, who, like Sullivan, learned about BOLD by attending a club rush, agreed that some of the greatest benefits of being part of the organization come from members helping each other. "Those of us who know how to tie a tie teach the ones that don't know how," he said. "Some of our members don't own any professional clothing, so we go with them to Goodwill or to the Professional Closet (a service of MGA's Career Services office) to help them find some. Every Wednesday, members of BOLD are required to wear a suit and tie or business casual clothing to class." Vadell, now a junior, credits BOLD with helping him through a low period when he found it difficult to keep up with the academic work required outside of class. "I love the discussions we have in class, but I struggle with staying focused on homework," he said. "BOLD helped me with study skills that fit in with the way I learn. The brotherhood built into BOLD kept me motivated and kept me going." BOLD's success is reflected in data MGA has kept for almost two years. The average cumulative GPA of BOLD members is improving, showing modest gains since 2016. Not one BOLD member has dropped out of MGA over the time tracked so far. The Student Life office has further recognized BOLD for its achievements by naming it the student organization of the year for three years in a row. "What's most impressive about BOLD is that it is mostly student-run," Guyton said. "The students take ownership of it." Guyton is also heartened by another recent BOLD development. Middle Georgia State has added two BOLD alumni to the University staff. Aaron Lewis is now a Residence Life coordinator based on the Cochran Campus. Tyler Cooper is a Macon Campus-based recruiter for the Admissions office. "BOLD produces amazing talent, and now it is generating employees for Middle Georgia State," Guyton said. Sullivan, the Cochran Campus BOLD president, is majoring in aviation management and working with the Career Services office to help him sort out his professional goals. He expects his BOLD experiences to continue helping him reach his goals in the years to come. "Our motto is 'Iron sharpens iron,' meaning we help each other and expect good things from each other," he said. "That won't stop after college. It will keep going."